Dr David Jeremiah – A Sheep In Wolves Clothing – Coercion Code – "Dark Times are upon us"
– Dr. Bill Jackson, president of the Association of Fundamentalists Evangelizing Catholics (AFEC), prepared a 6/18/99 statement on “The Gospel of Jesus Christ: An Evangelical Celebration” (EC) (see the 6/14/99 Christianity Today for the full text of the EC). This document has been endorsed by a host of psychologizers and neo-evangelicals such as Charles Colson, Bill Bright, and J.I. Packer, all of whom also signed the controversial ECT documents of 1994 and 1997; as well as endorsed by R.C. Sproul, John MacArthur and D. James Kennedy, all of whom publicly [albeit weakly] challenged and criticized them for signing the ECT documents. There are a number of helpful statements in this latest document which deal with areas which were not fully dealt with in the ECT documents (e.g., imputation is now dealt with favorably, but has been consistently opposed by Roman Catholic Councils and Catechisms). EC says, “We cannot embrace any form of doctrinal indifferentism by which God’s truth is sacrificed for a false peace.” But there is certainly no better example of “doctrinal indifferentism” than the ECT documents themselves (James 1:8)! Because ECT I stated that “Evangelicals and Catholics are brothers and sisters in Christ,” in order to be relevant, the new EC document should be submitted to the Roman Catholics who signed ECT I and II. It is difficult to see how a person could subscribe to both ECT and EC. The only logical conclusion is for all who signed EC to remove their names from ECT. It also appears that the so-called “evangelical” ECT endorsers have been “let off the hook” by former critics. Interestingly enough, you’ll find quite of few of the above lavising praise upon Robinson’s and Richards’ book.3. You might recall the name Jonathan Morris, a young Roman Catholic priest, from James Robison And Rick Warren Working To Reverse The Protestant Reformation. There I gave you the video and transcript of Morris’ 12/1/11 appearance on James Robison’s Life Today TVprogram where it’s clear Robison considers the apostate Morris a brother in Christ. The man to the right of Jonathan Morris might seem familiar to you as well. Actually, in The Emerging Church Is Unaware It’s Dead I told you that Robert Sirico, a Roman Catholic priest who founded a think tank known as the Acton Institute, actually preached at Mars Hill Bible Church for Rob Bell—former icon of the Emerging Church. Since this UGI is a spiritual sinkhole, I can’t cover everything that needs to be pointed out here. So, until next time, I’ll only focus upon this further reversing of the Reformation. No practicing Roman Catholics can take the platform at a Christian leadership conference without rebelling against Scripture. We’re told “people of faith” are coming together at UGI; which faith? That of the Roman Catholic Church who left the Body of Christ (cf. 1 John 2:19) to follow her own antichrist dogma and would end up placing her never rescinded anathema upon the Gospel of Jesus Christ. No light matter. Can you see there; those teaching false doctrine are involved in wicked works. This means people who promote and help advance such as these take part in his wicked works. That’s not merely my opinion, and it also isn’t open to debate; this is what God Himself has instructed us in His Word. 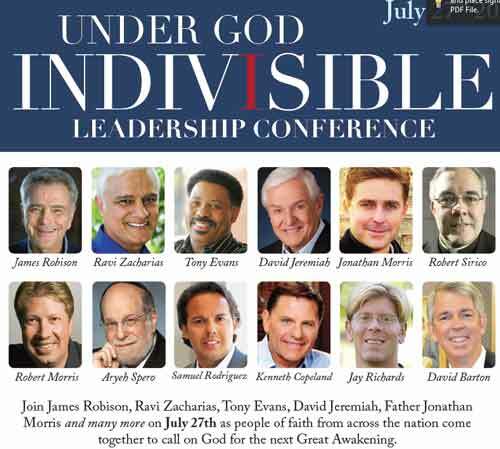 In the end, according to the Word of God, each Christian who shares the platform at this Under God Indivisible with Roman Catholic apostates like Jonathan Morris, Robert Sirico, and Jay Richards is giving them credibility in the Christian community and also taking part in their wicked works. This now becomes a vivid illustration of the foolishness of making your nation an idol and thinking as men think (cf. Matthew 16:23). For you see, to give the impression that the purity of the Gospel really doesn’t matter is exactly the wrong message to set before the world which desperately needs it. Frankly, as I see it, men like Ravi Zacharias, Tony Evans, and David Jeremiah should be ashamed of themselves. A George C. Hale once worked for David Jeremiah at Shadow Mountain Community Church and Turning Point Ministry. Hale resigned in 2009 because he had misgivings about the way Jeremiah handled his book marketing and sales. Warren Throckmorton obtained an open letter to David Jeremiah and Turning Point Ministry. As he discloses in the letter below, Hale has approached David Jeremiah and Jeremiah’s agent, Sealy Yates, about the best-seller methodology. For several weeks, I have periodically reached out to Turning Point and Sealy Yates with no acknowledgement of my contacts. Hale believes that Turning Point employees who speak to the press about the book selling scheme will be fired. After this occurred I voiced my concern as to the ethics of such action to David Jeremiah. I was also concerned because Turning Point could have purchased the same books directly from the publisher for approximately $10 each instead of the $25 each paid to the book retailers. David assured me that his agent and attorney, Sealy Yates had opined that the transactions were honest and ethical.This same action was repeated during August, September and October 2008 with the same results. I again requested that Turning Point not repeat such transactions as I could not discern any benefit to Turning Point for purchasing the books at retail verses purchasing the books wholesale from the publisher. I thought the transaction to be unethical. David told me that he would take my advice under consideration. David Jeremiah, in his 2003 book Life Wide Open: Unleashing the Power of a Passionate Life, quotes many mystics favorably, including Sue Monk Kidd (goddess worshipper), Peter Senge (Buddhist), and Catholic “saint” John of the Cross. Seven years before Jeremiah quoted favorably from Kidd, she published The Dance of the Dissident Daughter, describing her journey from a Southern Baptist Sunday School teacher to a goddess worshipper via the path of contemplative prayer. “As I grounded myself in feminine spiritual experience, that fall I was initiated into my body in a deeper way. I came to know myself as an embodiment of Goddess. … The day of my awakening was the day I saw and knew I saw all things in God, and God in all things” (The Dance of the Dissident Daughter, 2002 edition, p. 161, 163). Lighthouse Trails reports: “Jeremiah’s church, Shadow Mountain, encourages their men to become involved with contemplative spirituality. Currently, Pastor John Gillette of Shadow Mountain encourages the use of Richard Foster’s book, Celebration of Discipline. In 2006 Jeremiah signed on with Ken Blanchard and Laurie Beth Jones in the Lead Like Jesus conference. Jeremiah’s 2006 book,Captured by Grace, discusses Henri Nouwen and includes endorsement by Ken Blanchard” (“David Jeremiah Quotes New Ager,” Lighthouse Trails, Nov. 19, 2007). And there there is the false Christian. This is a person who is a tare that is mixed in with the wheat. The person whose heart was thorny ground or rocky ground when the word was delivered, and seemed to have thrived for a while, but then faded away. (Luke 8:6-7). Some people fall away from the truth quickly, like Charles Templeton. Others, like Billy Graham, take a lifetime to reveal themselves. Either way, for the person who doesn’t truly believe, no matter how hard they try to blend in, their sheep mask will someday slip and reveal the wolf. It is the case with Dr David Jeremiah. There are many detailed examples I could give. I won’t. I’ll give three. They should be enough to demonstrate that the pastor of Shadow Mountain church and narrator at Turning Point television and radio is no longer to be trusted. Jeremiah regularly appears on Trinity Broadcasting Network (TBN) alongside Paul Crouch (when he was alive) during their fall Praise-A-Thon. TBN is a broadcaster of heresy, an exporter of error, and a brood of vipers. Their prosperity Gospel, false claims of holiness healing, charismania, greed, and pure unadulterated contempt for the people watching is grievous. One look at their regular programming schedule from 2010 shows faithlessness at every hour. The schedule from today is equally bad. Below is a screen shot from the November 2014 TBN Praise-A-Thon where Jeremiah is ‘preaching’ the sowing principle. Also known as ‘sowing a seed,’ in this still pic, Jeremiah was urging people to send money to TBN based on the sowing principle. He said that even God believes in the sowing principle, you know, He sent His Son to be sown into the world and now we are reaping the harvest. At the crawl along the bottom of Jeremiah’s ‘sermon’ was a promise that a donation of any kind will result in the donor being sent a bottle of “Psalm 45 perfume”, fragrances from the bible bottled in an attractive container…and there were phone numbers along the top for people to call now. Gross. A person wrote to GotQuestions about the doctrine of sowing a seed to reap a financial harvest. … The central theme in seed faith giving is the money you give to spread the gospel God would multiply back to you thirty, sixty, and one-hundredfold. TBN (Trinity Broadcasting Network) not only sponsors these false ministries but has unreservedly adopted the gospel of greed heresy. TBN is a major media portal to the world, responsible for sending the gospel of greed heresy to hundreds of millions of unsuspecting people, and taking what little money they have. The gospel of greed has become a means of livelihood for prosperity preachers who live lavish lifestyles while telling you to send money to get more money. Jan Crouch, in her soft sugary voice said on TBN, “God has a special blessing for the little women who have caught the vision of giving, even if only their grocery money.” While there are many Christians who see TBN and its association with the gospel of greed ministries as an abomination, many others (not well versed in the Bible) believe in the heresy and fall prey to its deception. And not only is Jeremiah partnering with them, but is urging people to send money so the unbiblical heresies can continue being exported and the deception can be continued. Jeremiah was asked by the Downey/Burnett duo to write a companion book on Acts as a sequel to their miniseries titled “The Bible”. The new tv show is called A.D. The Revolution Continues and will be broadcast on Easter. The married duo also produced The Son of God movie seen in theaters. You might remember Roma Downey in the long-running tv show Touched By An Angel. Pastor Justin Peters said that The Bible was so lacking in a Gospel presentation that it wasn’t even accidentally given. 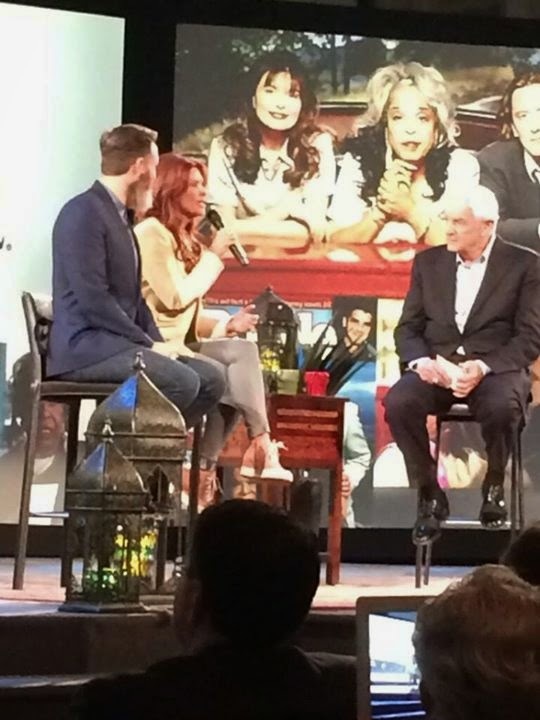 Below, Jeremiah and Downey/Burnett are at Shadow Mountain Church discussing the new tv show A.D. and Jeremiah’s new companion book based on the biblical book of Acts. The interview was held on March 12, 2015 at the church. If a person performs any of these sorceries, that person is detestable to God. That person is an abomination to God. And lest someone wrongly claim that the Deuteronomy verse is outdated just because it’s Old Testament, sorceries are also forbidden in the New Testament. Revelation 18:23 and Galatians 5:19-21 strenuously forbid such practices. Downey and Burnett have produced a tv show that twists the bible, presents another Jesus, fails to offer the Gospel, and they themselves have participated in New Age, direct revelation, mystical practices, and sorceries. Yet a supposedly astute and mature bible teacher such as Jeremiah has invited the duo to his pulpit and interviewed them in order to promote the next tv series, A.D. and by the way, his new book. In the interview Jeremiah flatly said that the duo creates shows that honor the word of God and doesn’t pervert it. Justin Peters was astounded to hear Jeremiah say this. Peters remarked that Jeremiah is well-versed in the bible and he knows when it’s being twisted. The only possible explanation for Jeremiah saying that “The Bible” mini-series honors God’s words is that he is being deliberately dishonest. If you know Justin Peters, you know he never says anything lightly, and rarely if ever, does he ever say anything like that. He was truly shocked. Do not be unequally yoked with unbelievers. For what partnership has righteousness with lawlessness? Or what fellowship has light with darkness? What accord has Christ with Belial? Or what portion does a believer share with an unbeliever? What agreement has the temple of God with idols? For we are the temple of the living God... (2 Corinthians 14-16a). John MacArthur explains what that verse means, and doesn’t mean. With Jeremiah, there is instead repeated partnership with darkness, evil, and error. He has no excuse. A friend who likes David Jeremiah was fully engaged in Jeremiah’s recent series on Revelation. Knowing I enjoy studying prophecy, he urged me to tune in to the sermon series. I did. As the sermon opened I was assaulted by pounding music and slick graphics. Then Jeremiah began reading. I could not understand where he was reading from because the passage didn’t sound like the Bible. I thought I must have missed something. I listened a bit more and then turned it off. I tried again the next week, and I realized as I listened to Jeremiah read a lengthy passage, and I mean for 10 or 15 minutes, he was reading his own book, Agents of the Apocalypse. I have a few things which are an immediate, instant determiner of my participation in or acceptance of an individual. When Rick Warren prayed in the name of Isa (a false god) at Obama’s first inaugural, I immediately knew Warren was not a true Christian. I dismissed Warren from my mind then and there. When Billy Graham said that any person living in a jungle who never heard of Jesus or the bible is saved and going to heaven, I knew without a shadow of a doubt the man was false. And when Jeremiah read from the pulpit his own words instead of God’s words, I knew he did not have the heart of a pastor nor did he have a transformed mind. How dare any person substitute or equalize man’s words from the pulpit instead of God’s. 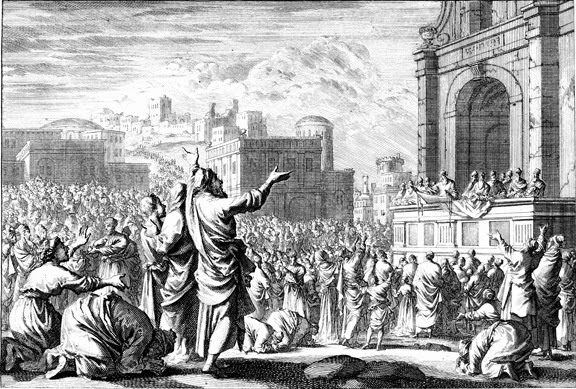 Can you picture the momentous scene in Nehemiah 8:1-2? On Easter Sunday, Turning Point Television will begin airing our new series, A.D. The Revolution That Changed the World. This teaching series is the “Scripture behind the story” of the dramatic NBC television event, A.D. The Bible Continues. Gross. Hollywood overtakes Shadow Mountain. I am indeed sad that many people who like Dr David Jeremiah will be grieved to read this news, myself included. However, the work of the Christian is to uphold the glory of Jesus, to warn of apostates, and to encourage each other in the Word. When a man alleging to be an undershepherd of the Lord hawks his book from the pulpit during Sunday service, presses the poor to sow a seed so TBN can continue promoting doctrines of devils, and when he pollutes his own stage with a necromancer, we must call a spade a spade and glorify the Lord by warning about Dr David Jeremiah. Please take these things under consideration, and continue to pray for wisdom and discernment as more and more men and women are revealed who have fallen prey to satan. Pray for them, and pray for your fellow church members. We are sheep among wolves. Alone, the wisdom of the serpent is mere cunning, and the harmlessness of the dove little better than weakness: but in combination, the wisdom of the serpent would save them from unnecessary exposure to danger; the harmlessness of the dove, from sinful expedients to escape it. In the apostolic age of Christianity, how harmoniously were these qualities displayed! Instead of the fanatical thirst for martyrdom, to which a later age gave birth, there was a manly combination of unflinching zeal and calm discretion, before which nothing was able to stand. Let us in this age do the same. Mocking. Look it up. It’s in the Bible too. Facts do count. 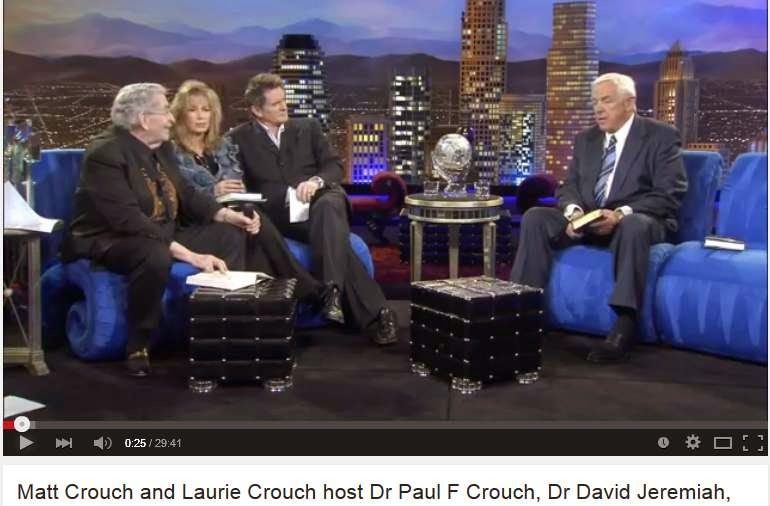 I never cared much for TBN nor for the late Jan and Paul Crouch’s ministry – all Hollywood B.S. 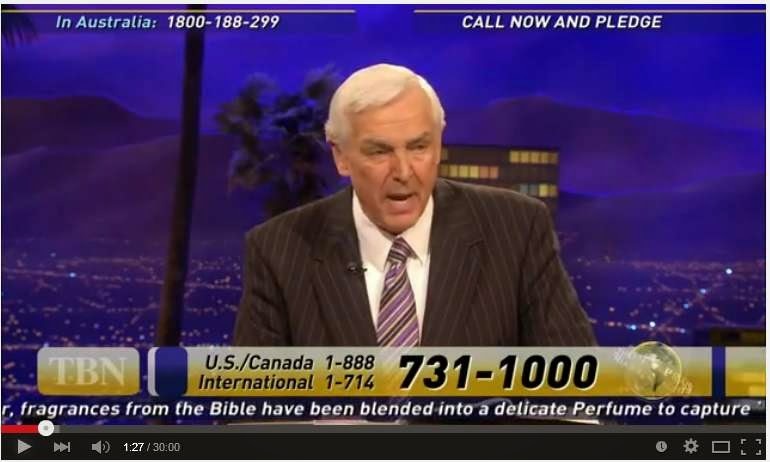 ; however, the appearance of Dr. David Jeremiah on their program does not necessarily make one guilty by association. I could attack ever pastor or church in the world for the celebration of “Easter” which is pagan, but we know that we are talking about the Resurrection. There are other critics of Dr. David Jeremiah out there as well. I would be interested in knowing the background of Lance Goodall (early life, education, and current profession) to judge his qualifications. Regards.